Andrew Flintoff is the current face of Sure Men's Sport deodorant. To date Flintoff has featured in press ads for Sure, but this has now been taken further with a new internet film that sees Fred use a pedalo to outwit 'two Aussie pranksters' and get to the ground. This Sure film plays on the 2007 controversy that was created by the now infamous 'Fredalo' where Flintoff was 'involved in a drunken 4am escapade on a pedalo' during the cricket World Cup in the West Indies. 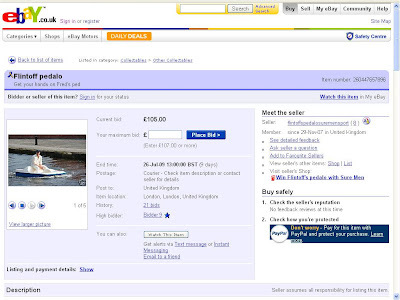 Sure have also listed the pedalo used (complete with Flintoff signature) on Ebay here - raising funds for Flintoff's charity the AF foundation. The Sure film is clearly advertiser funded so it will be interesting to see if this is embraced by internet users or shunned for being too contrived - though the Ebay auction is a nice touch and in support of a good cause.